When looking at the “big picture” of your finances, there’s a lot to consider. From your line of work or education to your daily spending habits, let’s break down where all the money you’ll earn in your lifetime will go. Have you wondered how much you will make in your lifetime and whether you will make enough to sustain your expenses after retirement? This article will talk about how much money you can expect to make and how much of your income you will spend in your lifetime. How Much Does an Average American Spend? How Much of Your Income Goes into Living Expenses? How Does Your Salary Compare to Those of Your Peers? According to a survey conducted by the US Census Bureau in 2015, the median individual salary of an average American is $33,617. Based on calculating the average career expectancy to be 40 years and assuming the annual salary to remain static throughout the career, an average individual in United States is expected to earn approximately $1,344,680 in his/her lifetime. As for couples, the median income is $82,078. When calculated with the same formula, the average household is expected to earn $3,283,120 in its lifetime. The fact that you may work more or less than 40 years. You may think these numbers are not relatable to your situation at all, but quite the contrary! It plays an important role in allowing you to start visualizing how much money you can make in your lifespan and how you measure up against the rest of the country. If you are over the median range, you are off to a great start. But if you are below the median, do not be discouraged. By understanding how various factors can affect your salary earnings, you can work towards a better future. One of the reasons that you may earn less than the country's median annual income range is that you are a relatively fresh employee. Because age is often correlated with job experience and knowledge/expertise, it is rather predictable that younger workers earn less than older workers. But the question is how much salary change can you expect in your career? And can you expect your salary to plateau in a certain age range? 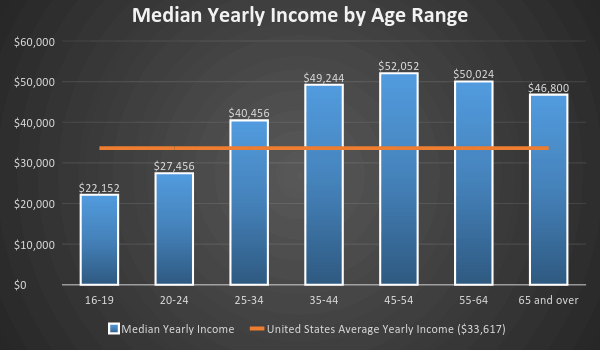 As illustrated in the graph, the age group between 16 and 19 has a much lower annual income. This is because the jobs available to individuals in this age range tend to be minimum wage entry occupations that are often related to manual labor workforce. As seen in the 20 to 24 age group, the wage increase leaps by about $5,000. This has to do with the number of workers achieving a higher education and receiving much better wages in their early 20s. According to statistical studies done by the Federal Reserve Bank of New York, your salary in your 20s has a major effect on how your salary will increase in the future. In essence, the higher your start-off salary is, the more drastically your wages will increase between the ages of 25 and 55 before tapering off until your retirement. For the average employee, the wage will surge by 38% between the ages of 25 and 55 and then plateau as they shift towards retirement. Sadly, this only applies to individuals who are within the average range. Those who remain among the lowest 5% of earners in society actually see a decline in their incomes over the years between the ages of 25 and 55. This is because many of these low-paying jobs are manual, labor-intensive occupations and individuals are much more likely to suffer from physical injuries and to be pushed out of their jobs as they become less productive. The only individuals who continue to see their salaries surge ahead are those lucky ones who rank in the 95th percentile range of America's economic status. These individuals are most likely highly educated professionals such as lawyers, engineers, doctors, technology-related experts, and large business owners. During their career, they can expect their income to grow 1,500% of their starting wage. With so many college students so heavily in debt, many people wonder if higher education is really worth the investment. As mentioned earlier, from the analysis of the wage difference based on age differences, those in the 16 to 19 age group are usually workers who do not have a college education. There are even individuals within that group that have not graduated from high school. Relying only on their restricted amount of knowledge and skills, they have a very limited amount of occupation selections. On the other hand, just by having a college degree, individuals will considerably increase their occupation options and are 20% much more likely to be hired than those who only hold a secondary school diploma. As of 2015, fresh college grads already earn $5,000 more than workers without higher education. Over time, the wage gap between the two groups will drastically become wider as the higher schooling group sees a constant wage increase whereas the latter group remains as minimum wage workers of the society. For skeptics who raise the problem of student loan debts, here is an analysis of whether a college degree is truly worth your time and money. According to the data provided by the National Center for Education Statistics, the cost of a 4-year college education averages around $56,000. In 2010, the cost of the same education deal averaged around $82,000. Just by going over these four factors, one notices the rise of tuition fees is not so drastic after all. Even though you are required to pay back the student loan, your immediate higher pay and substantial wage increase over time will allow you not only to get out of debt sooner but also to purchase a home faster. However, if you decide to forego higher education and opt to enter the job environment sooner, even though you may start earning money earlier, you will have less chance of a wage increase. Over time, that will make you the hare in the money race. If you are still not convinced, let us take a closer look at the survey conducted in 2016 by the United States Bureau of Labor Statistics. Full-time employees who are 25 years old and over without a high school diploma have a median weekly wage of $494. Full-time employees who are 25 years old and over with only a high school diploma and no higher education have a median weekly wage of $679. Full-time employees who are 25 years old and over with some higher education (e.g. 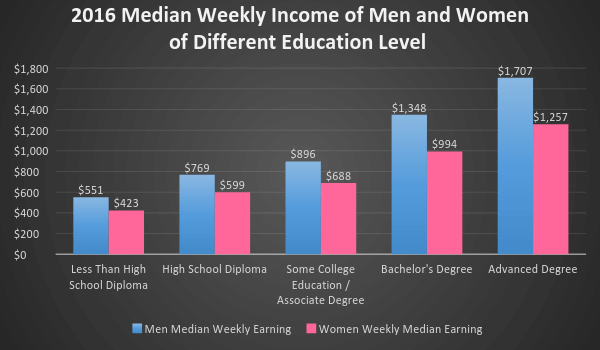 associate's degree or some college experience) have a median weekly wage of $782. Full-time employees who are 25 years old and over with a bachelor's degree have a median weekly wage of $1,155. Full-time employees who are 25 years old and over with an advanced degree (e.g. professional training, master's, and/or doctoral degree) have a median weekly wage of $1,435. 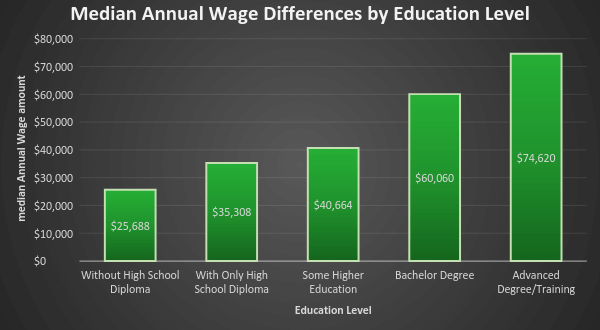 If you take a look how much the median bachelor's diploma-holding individual makes in a year ($60,060), a 4-year education merely costs 1 ½ years of their earnings. In exchange for the tuition fee, you can climb to a much higher earning status within a shorter amount of time. If you need even more proof, according to the information provided by U.S. Census Bureau, it is estimated that a master's degree will earn you about $1.4 million more in lifetime earnings than if you were to hold only a bachelor's degree. Solely from this information, we can see that a higher education degree will boost both your starting income and your wage increase over the years. Something often not mentioned is the added work-related benefits enjoyed by people in higher education jobs. They can enjoy more paid vacation days, which translates into fewer actual working weeks, than the lower education group does. Moreover, these individuals also enjoy other work-related benefits such as better health insurance and life insurance plans as well as more money put towards their retirement savings. All these can decrease their annual expenses and increase the money they can enjoy after retirement. So unless you are the next Bill Gates, Steve Jobs, or Mike Zuckerberg, attending college is always a great investment to boost your earning power. Any college degree, associate degree, and even some college education, will allow individuals to earn more than those with only a high school education. This fact is true whether you are comparing income during the start of a career, midway in a career, or at the end of a career. There is always a discrepancy in salary amongst individuals within the same occupation. Those who are more qualified or trained in a more prestigious college will often receive a pay rate that is higher than others. There are always exceptions to the rule. Some individuals with only a high school diploma will out-earn those with a bachelor's or associate's degrees. And there will be some college graduates who will earn an income that is within the low-income range. The top 90th percentile high school graduates out-earn the bottom 10th percentile of college graduates no matter what major they studied. Degrees that accentuate measureable specialized skills tend to project the highest earnings. Some examples are engineering, physics, logistics, computer science, finance, and economics. Degrees that are associated with children education, home economics, religion studies, counselling, social work, and fine arts tend to have the lowest median incomes. Should People Make the Switch to More Profitable Degrees? After looking at the earnings data, many people might jump to the conclusion that if they immediately switch to another major, their salaries will make the adjustment and subsequently increase their lifetime earnings. This assumption is flawed, however, as many other factors can contribute to differences in salary. Your grades matter. If you make a sudden change, you might not be as well-prepared as other students who have concentrated on the same field since as far back as high school. With much more knowledge and experience (e.g. intern jobs, related volunteer work, awards, and scholarships), they will have better opportunities to score much higher-paid starting positions than you. You may lack many prerequisites to make the faculty switch. In a worst-case scenario, your college may not offer the program you are looking for. Your current college may not be known for certain degrees. Even if you make the change, your resume may look less impressive than those of individuals who have graduated from more prestigious programs. Even if you make the switch right away, you have wasted the last few years and will lose more time in catching up with your peers. By entering the job force later than your peers, your lifetime earnings will be significantly less than individuals who have graduated earlier with relevant work experience. The truth is that the data presented only shows the median salary calculated from the census survey of all individuals who work full-time in their industry. It means that 50% of these individuals will earn more than the median and 50% will earn less than the median. As mentioned before, there is always an exception to the rule. Depending on your knowledge, credentials, and skills, you have the ability to make much more money than your peers. What matters is whether your knowledge and skills are in high demand. For example, a hairdresser is expected to earn about $30,000 as their annual salary. However, elite hair stylists who work with performers and are top of their game can expect to earn upwards of $80,000. Although there is a relatively fixed amount of hours an individual has to work throughout a week, the total hours of work can vary depending on a person's attachment to their job. The top percentile earning group can work as many as 18 hours per day for 6 days of the week. Others may be forced to work a flexible part-time schedule to accommodate their family needs (many mothers choose this as a way to juggle both work and kids in their lives). Based on the working hour differences, it is no wonder that some individuals earn less than the median while others thrive way past their peers in income gain. Many employers are willing to pay extra for an employee who obtains more credentials, job experiences, and skills. They are also willing to pay for individuals who have knowledge of more than one major, so instead of hiring two persons for the purpose, they can hire one person to multitask. This scenario is also true for jobs that do not require a diploma. For example, individuals who are knowledgeable in both auto repair and business administration can expect to earn an income of around $93,500, whereas an auto technician will only earn about $59,000 as their annual income. There are certain jobs that demand employees to work odd hours. In order to compensate for the physical and social strain result from working outside of regular hours, these individuals are paid a premium bonus or increased wage for the sacrifice. As a result, they can earn more money than individuals who work the same number of hours during normal working hours. This applies whenever a job requires one to work under unsafe conditions or handle dangerous chemicals. Some examples are nuclear reactor operators, petroleum engineers, professional golf ball divers, pilots, firefighters, stunt doubles, grinders, commercial fishermen, and mining machine operators. Other times, it is the undesirable nature of the job that makes a certain occupation higher in salary status. Some examples are funeral home directors, plumbers, farmers, ranchers, ship engineers, water vessel captains and mates, and criminal investigators. Job availability is a contributing factor of lower annual income for minimum-wage occupations. For the blue-collar group and minimum-wage group, many companies try to cut down on expenses by putting their workers in permanent part-time positions. This is a way for them to avoid paying for workers' health insurance benefits and paid vacation days. As a result, employees are forced to earn a limited amount of income even though they are willing to work more hours. In many cases, these individuals are forced to work several jobs and finagle a schedule that will fit into all their part-time hours and earn enough to pay for their living expenses. The number of candidates who qualify for the position. Occupations that require less specific skills are more prone to have lower wages. This is because employers have more applicants to choose from. In most cases, they choose a candidate who is willing to work for a lower wage. On the other hand, jobs that require very specific knowledge and skills tend to foster a higher income as there are fewer candidates who have the aptitude for these positions. In extreme cases where there is great demand for a job yet very few candidates who have acquired both the knowledge and skill prerequisites, the salary will be extremely high. Some examples are medical surgeons, international affair lawyers, forensic accounting investigators, and petroleum engineers. In addition, some jobs do not involve work for an entire year. As a result, some occupations may suffer lower incomes due to hour-limitation issues. For example, teachers often do not teach during the summer; in order to receive continuous pay, they may be required to pick up summer teaching jobs. The same goes for job fields that only operate during certain seasons such as commercial fishermen, mining machine operators, skiing instructors, and stunt doubles. There is an income discrepancy within a field depending on the position within the industry. For example, individuals who work as accountants in the local public education system will have a much lower pay no matter how many hours and how hard they work compared to an accountant at a prestigious firm or a forensic accountant. What many people neglect about variations in earnings is geographic location. Depending on where you reside, you may earn more or less than your peers from other parts of the United States. Just to make a point, the United States median household income is $50,296, whereas Maryland has a median household income of $70,004 and Mississippi has a median household income of $36,919. But why is there such a big discrepancy in annual earnings among the states? Job availability varies in different regions of the country. According to research studies, job availability has a lot to do with innovations and technology. It has been estimated that, for every high-tech invention job that is added in a region, five jobs are added to the local workforce. As a result, cities such as San Jose, Seattle, San Francisco, New York, Boston, and Los Angeles continue to have a great number of jobs available. At the same time, these high-tech jobs tend to be much higher-paying as they require specific expertise and skills using the latest innovations. On the other hand, remote areas that are far from high-tech centers continue to suffer from job loss. And because these areas focus on agriculture or manufacturing, the only jobs available tend to be blue-collar and labor-intensive positions. As a result, the population tends to receive lower pay. The cost of living differs from city to city. In high-tech-savvy areas, because there are so many high-paying positions, many people can afford to spend more money. This results in businesses' charging higher prices for products and services. By contrast, the population of remote areas tend to have lower wages and less spending power, therefore making the cost of living significantly lower. State differences in tax regulations also cause discrepancies in salary. States that have higher taxes tend to have higher median wages. By contrast, states that have lower taxes tend to have lower median wages. Many articles tend to skip over this crucial fact – gender inequality still exists in the realm of salary. Even though women now make up almost half of the employees in the United States, they continue to earn at least 20% less than their male colleagues. This means for every dollar earned by men, women earn only 80 cents. According to the statistics compiled by the American Association of University Women (AAUW), the average earnings ratio between men and women falls at 80%. However, a look through the data of each state points out that the ratio fluctuates between 89% and 64%. Why is there such a gender inequality when it comes to salary? Can education be the key to the earning difference? Even when the data is analyzed based on education level, the gender inequality persists. As a matter of fact, the variation becomes much more severe in the bachelor's degree and advanced degree categories. The main reason why women's median earnings are significantly less than men in the United States is that there is a lower concentration of females working in the highest median earning positions, which tend to be in the high-tech innovative science field. Another reason women tend to earn less than men is that they tend to work fewer hours so that they can be more available for their children and for family needs. Consequently, their annual incomes suffer from the sacrifice. Most Americans live from paycheck to paycheck and burn through money much faster than they can think without realizing where their salary went. Assuming that an individual starts paying for expenses at 20 years old and dies at the age of 80, they will have 60 years to spend their incomes. Please note that these calculations are based on average expenses compiled by various consumer survey studies. In reality, most people will either pay more or less than these numbers depending on a combination of variables such as their residing location, needs, income, and their economic status. Please also know that not everyone will retire at age 60; some people will retire before 60, whereas others will continue to work into their 70s or even older. It's scary how easily expenses can stack up and run you into debt. As you can see in the example, lifetime spending appears to be more than lifetime income. Although it may not be an issue when you are earning money, it can turn into a disastrous problem when you retire and you have no investments or savings to cover your living expenses. Even though the United States Census Bureau reports the average lifetime earnings to be $1,400,000, do Americans actually have this money in their bank at their retirement? Just browsing the total lifetime spending of the average American would tell you that the answer is no. Then how much money do people have in their savings accounts? For a lot of people, especially younger, it's frankly just way too hard to save. Don't let this discourage you, as there's always a different approach to start saving, no matter what you've tried before. Almost no one will make exactly the same amount as the average income. If you want to know how your earnings compare to the rest of America, the IRS has a better way for taxpayers to find out where they stand by categorizing tax return data into salary group ranges. What you earn is not really how much you get. As a taxpayer, you are required to pay both federal tax as well as state and local taxes. The table above only takes federal tax into account. In reality, the amount of tax you can expect to pay depends on your annual income, taxed at 7 marginal rates: 10%, 15%, 25%, 28%, 33%, 35%, and 39.6%. These percentages are based on the tax year and whether you are filing as a single individual, jointly as a couple, separately as a couple, a widow/widower, or head of a household. These tax rate brackets can adjust over the course of a taxpayer's lifetime due to policy changes and inflation costs. At the same time, no one earns the exact same amount of income over the course of their career. Apart from tax fees, did you know that most Americans will spend a chunk of their income paying for interests? According to the statistics provided by Federal Reserve Bank of New York, the average American consumer is expected to pay $280,000 in their lifetime on interests from their home mortgages, credit card debts, and car loans. Similarly to income, where you live can affect your debt amount and credit score. In areas that have higher median salaries, home prices, auto values, and costs of living are higher. Consequently, people will owe more money due to their mortgage and loan rates. Americans have long enjoyed spending their paychecks on shopping. Many people see it as a sense of joy to have their hands on the latest fashion or technology gadgets. Also, when spending is so easy with the help of credit cards and online shopping, many do not think about how much they have spent until the bank statements come in the mail. Even though the previous spending template has touched on how much money is spent on food, drinks, and clothing, just how do these numbers arise? Moreover, what living options will affect the increase or decrease of the average spending cost? According to the United States Census Bureau, the average American household comprises 2.5 people with an average spending of $6,000 on food each year. Suppose a household has three meals every day within a year – the total adds up to 2737.5 meals for these 2.5 people annually. If you divide this number by $6,000, it means that the average individual in the United States spends $2.41 per meal and $7.23 a day on food. So, for the families that enjoy going out for meals or drinking alcohol, they will find that their expenses are much higher than $6,000 per year. For those looking to cut costs in this area, it's not impossible to eat well on just $50 per person, per month. For the average American household, an average annual spending of $3,000 goes into entertainment. This can involve anything from going out to get Redbox rentals to signing up for Netflix subscriptions. If this amount were to be broken up into 12 months, it would come to $250 per month. For those people who have expensive hobbies, this can significantly increase their annual expenses. On the other hand, those who use volunteering and free entertainment resources (e.g., make use of library rentals, free outdoor activities, or free gaming apps, to name a few) can minimize their spending for saving purposes. Housing expenses can differ drastically depending on whether an individual has purchased a home or is renting a home. If you own your home, your expense will include your mortgage fees, mortgage interest, maintenance fee, and property tax. However, if you are renting, your expense will be much lower as you only have to worry about your monthly rent. Although your rent may accumulate to a much lower amount than the expenses of a homeowner, the amount you pay to the landlord cannot be recouped. On the other hand, even though homeowners have to pay higher expenses, they can recover some costs by treating their home as an investment since real estate has a tendency to increase in value over time. Unless you are forced to sell your home when the market demand is low, a housing investment is often a safe choice for individuals who have little experience in investing their money. At the same time, if you own your home, you will have much less expense to worry about, as you will have paid off your mortgage before your retirement. As long as you can pay your annual property tax and other debts, no one can kick you off your property. For people who are interested in purchasing a home, the United States Census Bureau concludes that the average American will own 5 homes in their lifespan. If you are regarding your home as an investment, you should know that every time you sell your home, about 10% of the price will be used on agent commissions, transaction fees and tax, and moving costs. So before you sell a home for profit, you should consider whether you will still earn money after deducting 10% of the asking price. Also, if you are using the money to purchase your new home, you are channeling the money not into your spending but into your net worth until you sell the home for another profit. When it comes to owning a car, the average cost of transportation expense will be around $8,500. Unlike the value of a home after purchase, automobile values depreciate the moment the car hits the ground. So, opting for public transportation that can cut down the expense makes sense for people who live in cities. However, for individuals who live in smaller cities or in remote areas where public transportation is scarce, owning a car is the only way to get to work and deal with essential chores. You may think that if people are spending more money than they can earn, they are obviously not saving any money and probably wasting a lot on unnecessary expenses. Nevertheless, once you go over the details of various expenses, you may be surprised to find that the average American is actually not wasting an enormous amount of money and there is truly not anything you can reduce and instead set the money aside for savings. Then, why are some people able to accumulate a great amount of wealth while others find themselves left with very little savings upon their retirement? This is because there really are expenses that can be cut out. The problem is that most people hate the idea of making changes and shrinking their spending. The current retail market thrives on convincing everyone that they deserve finer things in life because they are worth the splurge. A lot of times, the splurge expenses have very little effect on your daily quality of life, and when you go over the details of your spending, you can probably find ways to shrink your expenses with some habit changes. 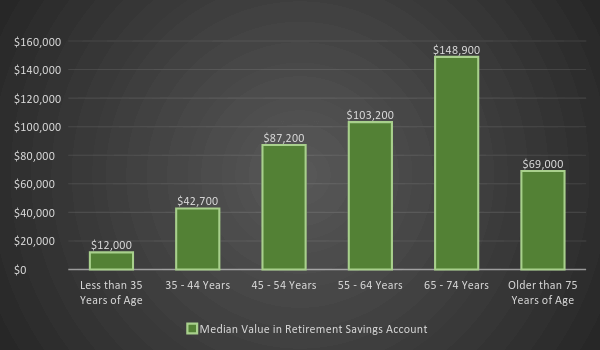 Running by the numbers, you can see the importance of saving diligently so that you can have plenty of money to sustain your quality of living after retirement. However, you may also notice that saving alone will not be enough to accumulate more money as you only make so much as your annual salary. Some individuals may pick up another part-time or freelance job to increase their earnings. Another great way to increase your wealth is to learn how to invest your money. Otherwise, you will forever be stuck in the paycheck-to-paycheck spending routine and end up broke by the time you retire. In our current society, we have no other choice but to become more flexible in spending our money and using inventive ways to invest our salaries for further profit. The sooner you begin the process, the faster you can see your money grow. If you decide to skip saving and investing, you will find yourself very helpless against financial difficulties and unexpected hardships. In the worst case scenario, you may find yourself without shelter and scraping for your last dollars on food and basic needs. It's not about your income; it's what you do with it. It's definitely doable to become rich even if your income is below the United States wage average. It is also possible for high-income individuals to become completely broke! The important difference that separates success and failure is how you choose to use your money. By living within your set limits and prioritizing saving and investing habits, you will enjoy having financial freedom and concentrating your energy and time on your family and your career.